Home Blog How to Stream any Videos to Apple TV 4/3/2/1 via VLC? How to Stream any Videos to Apple TV 4/3/2/1 via VLC? The new Apple TV delivers the most polished video experience today, with speedy reactions and a familiar yet attractive interface. It is a small network appliance and entertainment device that can receive digital data from a number of sources and stream it to a capable TV for playing on the TV screen. So you've got a fourth-generation Apple TV (the one with Siri Remote and all the apps) and you've just downloaded VLC, the "play everything" video app that was just ported to tvOS. The last few versions of Apple TV haven't included any storage for video files, and the same is true of the latest model: All the device's storage is for apps and associated media files. Getting your own videos up on the big screen using VLC takes a little finesse. 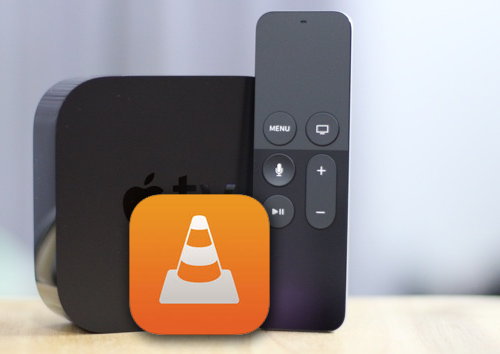 Here's how to watch any video (with a few caveats) on your Apple TV via VLC. First up, while VLC will play any video you can throw at it, AC3 audio support for .avi files doesn't seem to be working. If you try to play a file in this format, you'll be able to see the video, but it won't have any sound. Bummer. All the other video formats that I've tried, including .mkv, .mp4 and .mov files, work just fine. 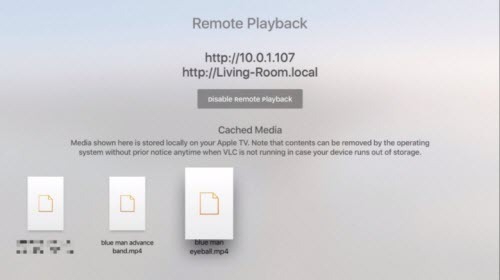 There are three basic ways to get VLC on Apple TV to play your videos: Local Network, Remote Playback or Network Stream. You'll need some sort of media server, like Plex, for the first one, a web browser for the second, and a web or FTP server for the third. Let's take a look at each in order. 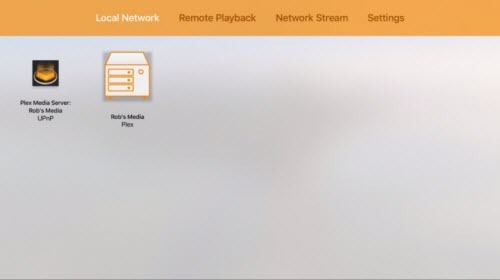 VLC supports Universal Plug and Play (UPnP) media servers (like Plex) and FTP servers running on your local network. The great thing about Plex is that there's an Apple TV app and a Mac server that will do all the work for you – just point it to a folder full of media files on your Mac and turn it on. If you've already got a media server like Plex up and running, using VLC to access the movies stored there is super simple. 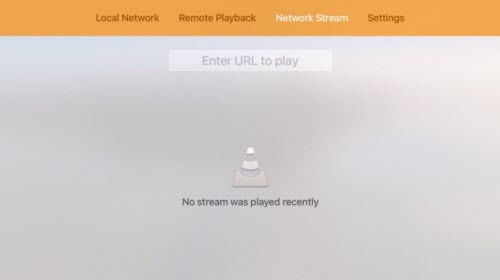 Launch VLC on your Apple TV, swipe left to go to the "Local Network" tab, and you'll see your server there. Just click through to your movies and they should play without effort. What's great here is that if your server doesn't support certain file formats, VLC should be able to. 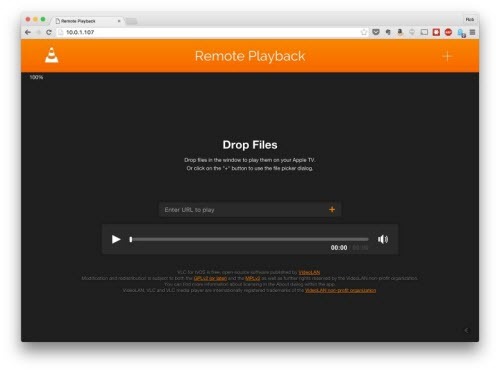 If you're not keen on running a server off your Mac, then the next best option is to use VLC's remote playback function. Swipe over to the Remote Playback tab at the top of the VLC screen on your Apple TV, and then you'll see the screen above. Click on the Enable Remote Playback button and you'll get two addresses, one with your local IP address (http://10.0.1.107 above) and one with the more easily read local network address (http://Living-Room.local above). Type either into your web browser and you'll get a web page that lets you drag and drop videos into it to watch on the big screen. Simply drag your movie files to the web page on your Mac, and — after a quick load — they'll start playing on your Apple TV via VLC. Exciting! If you've got an FTP or web server out there on the internet, you can use VLC to watch any videos you might have stored there. VLC for iOS also lets you connect with Dropbox and Google Drive, though I was unable to get a video I have stored on Dropbox to play on my Apple TV, your mileage may vary, and I'm sure the VideoLan team will have this up and working in no time. If you know the URL of your video file, swipe over to the "Network Stream" tab in VLC for Apple TV and type it in. It's tedious if it's a long URL (I'm looking at you, Dropbox! ), but once you've typed it in correctly, VLC will keep the last several URLs in there for you, which means you only have to do it once for each specific file. Now you've got three fairly easy ways to get any video you like up on your big TV via the Apple TV and VLC – enjoy, and let us know if you have any problems getting these to work. VLC can read several formats, depending on the operating system it is running on, including: Container formats: 3GP, ASF, AVI, DVR-MS, FLV, Matroska (MKV), MIDI, QuickTime File Format, MP4, Ogg, OGM, WAV, MPEG-2 (ES, PS, TS, PVA, MP3), AIFF, Raw audio, Raw DV, MXF, VOB, RM, DVD-Video, VCD, SVCD, CD Audio, DVB. Which apps should you be using on your Apple TV? That's what we're here for. These are the 25 best Apple TV apps out there right now. This is the one of the big boys and easily the most recognizable of any of the apps on this list. Netflix has been around for years, first as a rental service but most recently and famously as the juggernaut streaming service that can be found on just about any and all platforms. This is the app you're most likely to fire up and get lost in for hours upon hours. There are countless movies to watch, entire television series, and now, Netflix is starting to produce exclusive content like Marvel's Daredevil and Jessica Jones as well as rebooting the '90s sitcom Full House. Another cool aspect of Netflix is that it notices the things you watch and begins to make recommendations based on those things. So you might start out with a few familiar viewings, but will quickly find yourself immersed in something totally new before you know it. For the incredibly fair price of just $8.99 a month, it's easy to justify that cost when you get so much in return. If you own an Apple TV, it's almost your civic duty to not only open Netflix, but to use it as much as humanly possible. Meet the Netflix of cable television. Whereas Netflix primarily focuses on movies, Hulu Plus is almost entirely centered around television shows. It's not that Hulu doesn't offer movies — they do, quite a few, in fact — but they have a much more comprehensive television library at their disposal. Not only does Hulu have partnerships with just about major and minor cable network there is, meaning thousands of hours of television shows from start to finish, but they are about as close to "live" television as you can get without online streaming or having cable. Many shows post to Hulu as soon as the next day, meaning you can stay up to date with your favorite shows without having to wait for the show to stop airing its current season first. Like Netflix, it costs less than $10 per month to subscribe, and there are nearly an infinite number of possibilities for you to explore. And like Netflix, Hulu is beginning to put out its own exclusive content, meaning you can explore totally new possibilities as you search for shows that you watched in years prior. Even if you aren't a baseball fan, it's hard to find a more comprehensive app than MLB TV. There is almost nothing that can't be done on this app. Follow your favorite team by watching highlight videos, accessing comprehensive stats and getting the scoop on every MLB game. Of course, the latter is going to cost you a couple hundred bucks for the subscription, but you'd have to fork that over if you followed the traditional cable route too. And honestly, for only $130, that's more than fair for the amount of access you get. The only real downside is that there are local blackout rules. So that means if you're trying to follow your local team, don't have cable and didn't invest in an HD antenna to pick up your local stations, you'll have to wait until 90 minutes after the game has ended to watch. For baseball diehards everywhere, MLB TV is a must-have on whatever platform you can find it on. HBO Go is almost exactly as it sounds: An HBO-only app that allows users to not only watch HBO shows lie, but to stream thousands of hours of content on demand as well. All of the HBO classics like the Supranos are available to watch on demand at any time. The one downside of HBO Go is that it requires a cable subscription to use. So if you're looking to completely cut the cable chord, HBO Go isn't much help to you unless you have access to someone's cable login. Still, it's free to use in any event, and non-cable subscribers can still have access to a ton of clips and videos. When the time finally comes where we can be totally free and independent of traditional cable and all of its restrictions, we will look back at HBO Now as one of the pioneers. Basically the same thing as HBO Go, HBO Now requires a $15 monthly subscription but gets you access to all of the perks talked about in the last post: streaming live shows, episodes of every HBO series on demand, access to a megaton of movies. If you can find it on HBO, it'll be available on HBO Now. The $15 fee is entirely reasonable given the sheer amount of stuff you get back for subscribing to the service, and is a big step toward independence from cable companies or finally getting them to offer stations a la carte at a reasonable price. HBO Now is an absolute must-have if you own an Apple TV, and it will be worth every penny. Like the MLB TV app for baseball fans, the NHL.TV app is a must-have for hockey fans especially as hockey has become less readily available nationally the last few years. For a slightly more expensive fee of $159, users get access to every NHL game and can designate their favorite teams as well. There are blackout rules, so if you live local to your team and can't watch them on your nearby stations, you have to wait 48 hours before you can watch. Another issue is that nationally televised games are blacked out, which also happens to include the Stanley Cup playoffs and Finals. So the subscription is great until playoff time, then you're kind of on your own. Not only can users access live games, but there is a seemingly endless amount of highlights, videos and even access to archived games if that's your sort of thing. It is more than worth the price of admission even with the blackout issues and one of the best, most comprehensive sports apps available on the Apple TV. Have more questions about how to watch video on Apple TV using VLC, please feel free to contact us>> or leave a message at Facebook. 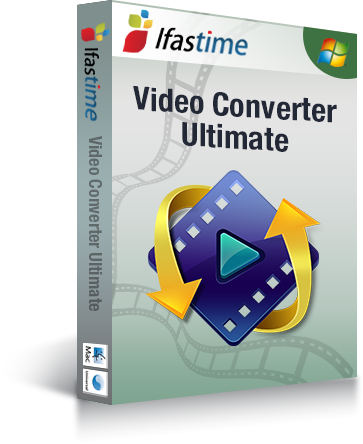 I love iFastime Video Converter Ultimate. Easy to use and Fun.